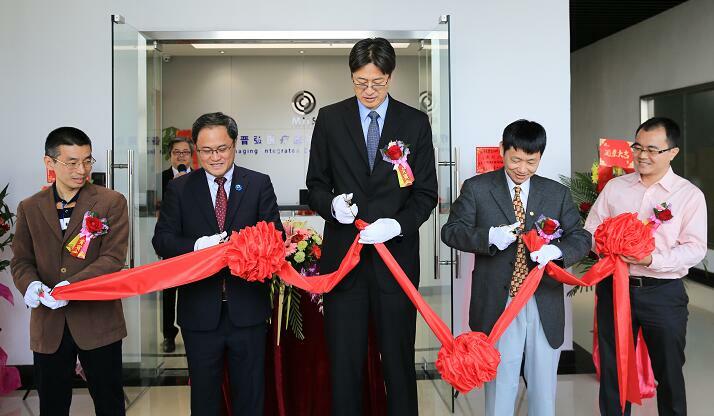 Yesterday saw the opening ceremony of Medimaging Integrated Solution Inc. (MiiS) held in Dongguan. It marked the first enterprise of Guanrong Program taking root and setting up a factory in the city. As the first signed enterprise of Guanrong Program, MiiS is committed to the development, manufacturing and marketing of digital hand-held diagnostic scopes complete with teletransmission and remote diagnosis, including otoscopes, ophthalmoscopes, dermatoscopes and endoscopes. Since its establishment in Songshan Lake, MiiS has been unfolding its business operations. Last year, MiiS joined the Dongguan Eye Health Screening Program for High-risk Populations (Hypertension/Diabetes Patients). Guided by the Ophthalmology Center of Dongguan People’s Hospital, 6,000 person-times of eye screening tests have been completed, accomplishing the pilot projects of hierarchical diagnosis and treatment, blindness prevention and treatment, and preventive medicine. “Today marked the factory opening ceremony of MiiS. The factory has been accredited GMP Factory by the Food and Drug Administration of Guangdong Province. It’s of high exemplary significance, indicating that this enterprise under Guanrong Program has taken root in Dongguan. It’s hoped that more enterprises will blossom here in the next 3 to 5 years,” Song Tao, adviser to the Municipal People’s Government, pointed out. MiiS is confident in its future development in Dongguan. The full color digit ENT-scope set developed by MiiS has been sold to about 50 countries and regions in the world, representing its international leadership in the industry. Furthermore, MiiS has become a strategic partner of Huawei. In the future, MiiS will continue to expand its Mainland Chinese and global markets based on Songshan Lake.